I’m not a big city kind of guy but now I have two regrets for not moving closer to New York City. For one, Eric Clapton’s Crossroads Festival took place this past April at NYC’s Madison Square Garden. And now? August 3rd’s, first ever, International Blues Music Day features a day long blues festival in guess where? Seems like a lot happens there. Understatement? Maybe I’ll get to witness the Crossroads Festival one of these days and maybe even somewhere closer to my town (Note to EC, please come to Charleston!) But today I’m a little bummed about missing out on the live concert and day of festivities in NYC to ring in the first ever International Blues Music Day. A year ago, a movement was born to bring a community together in celebration of a now global art form. The goal: To educate and honor blues music history and promote blues musicians. and international language known as Blues Music. Out of the movement an organization was born and International Blues Music Day was set for August 3, 2013. The day will end in NYC with a concert featuring some torch carrying blues men and women. What better way to celebrate the blues than that?! 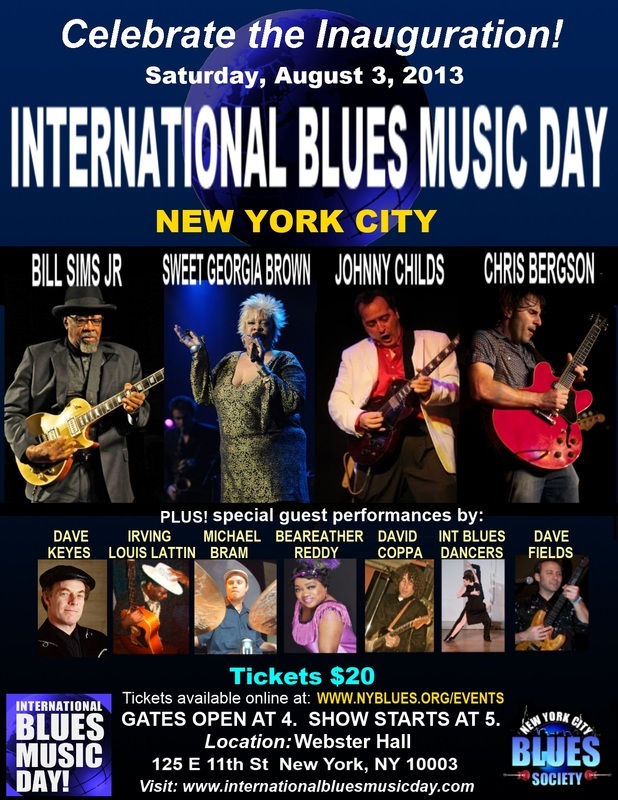 While you’ve gotta be ‘boots on the ground’ in NYC to catch this show, the International Blues Music Day is just that: International. This day is designed to bring the entire global blues community together in support of blues music. There are concerts and events in Moscow, Croatia, Italy and other countries as well. Maybe one’s near you? Whether you’re lucky enough to live near one of the events or not, this movement is global. We’re all invited. I’ve never really been a part of a movement before, I usually recognize that one is happening after it’s over. But this is something I can get behind. I love playing blues, talking blues and most of all, listening to great blues artists. I don’t think blues has the spotlight it once had, yet every time a blues band strikes up, people are there to listen. You cant deny the power of this music. People love this stuff, no matter what’s on the Billboard charts these days. Who cares about that anyway? Sure, the music that will happen on IBMD will be amazing. That’s enough of a reason for a dedicated Blues Day, but I think there’s a deeper message here. The blues brings people together. The blues tells a story, a story about life. That’s something that is shared globally. I think IBMD is completely on point by inviting others to get involved in their own way. We can all share this day, even if we can’t make it to the big show in NYC. If you’re interested, IBMD has invited us all to participate in IBMD in some way, however big or small. Go see a local blues band, tell them thanks. Learn a song you’ve been meaning to get to. Buy that album you’ve been meaning to buy. Talk to somebody about the blues. So, I’ll do my part by spreading the word to friends and strangers alike. Probably gonna learn that Mississippi John Hurt tune I’ve been meaning to get to. What will you do next Saturday to join IBMD? Are You Ready to Tune Up Your Playing?